The selections from my CDs were originally recorded during the late 1990s in the 招隱室, a room at my home overlooking the South China Sea in Cheung Chau, Hong Kong, then were edited in a professional studio. I had to record in the middle of the night, at which time the main obstacle was the noise of the motors in passing fishing junks. The other recordings included here are being made beginning in October 2006 in the new Studio for Seeking Solitude at my home near the Hudson River in New Jersey, facing Manhattan; at present, only primitive editing is possible. The room is rather quiet, but if you listen carefully with headphones you may sometimes hear way in the background the sound of passing cars, planes or helicopters. If it is a neighboring lawn care machine I have to stop. Regarding the melodies with lyrics, for those with the shorter lyrics I simply sing as I play. 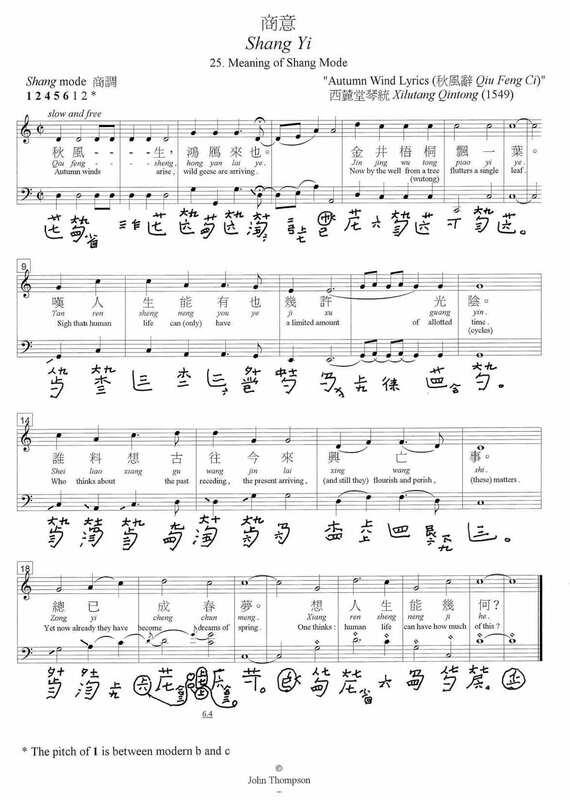 However, there are also here some songs that are too long or complicated for me to sing and play well at the same time (three are online at present: Ming De Yin / Kongsheng Jing, Qing Jing Jing, and the sung version of Jiu Kuang). For these I first record the qin onto the DAT recorder. Then I then play this back, listening on headphones as the sound is also fed through a Samson S-Mix, a small five-channel mixer. I then sing along through the original microphones, also hooking them up through the AERCO microphone preamp to the Samson. This mixed sound then goes to the CD recorder. I sing at the same distance from the microphone (about 1 meter) as I do when playing qin and singing at the same time, but at present the balance does not seem to me quite correct. Getting this balance right is a problem I am still working on, but in the mean time I am going ahead and putting some of these files online for two reasons. One is that some people have expressed particular interest in qin songs, but there are very few recordings currently available. The other is my hope that enough of the beauty of these melodies will shine through my amateur singing and recording that it encourages other people to sing the songs themselves.